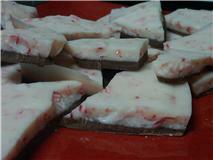 I located a new recipe at All Recipes that looked scrumptious and would cost me $0 to make: Holiday Peppermint Bark. You might be wondering, how did this cost nothing to make? Well, leftovers, that's how. At Halloween time I made "Magic Wands," pretzel sticks dipped in chocolate, so I had 1/2 a block of almond bark and 1/2 bag of milk chocolate fondu chips leftover. Then, at Christmas time, the boys raked in more candy canes than I could stand to look at. Those were all the ingredients I needed!